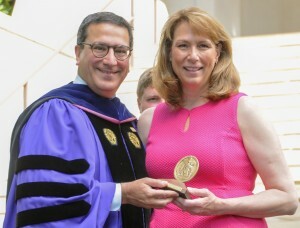 Spartanburg, SC – Spartanburg Methodist College President Colleen Perry Keith, Ph.D., was honored during the 161st Commencement Exercises of Wofford College with the prestigious Mary Mildred Sullivan Award on Sunday, May 17, 2015. “Dr. Colleen Perry Keith exemplifies the values set out by the Mary Mildred Sullivan Award through not only her service as the president of a fine institution of higher learning, Spartanburg Methodist College, but through her leadership and service to her community. She teaches by example through her leadership on numerous local, state and national boards and foundations. We at Wofford College thank her and commend her, and we wish her well as she moves on to lead Pfeiffer University,” shared Dr. Nayef Samhat, president of Wofford. Wofford College is one of 61 colleges and universities, most of them in the South, authorized to present the Algernon Sydney Sullivan and Mary Mildred Sullivan Awards. The Sullivan Award program, reflects the commitment and passion of Algernon Sydney Sullivan and his wife, Mary Mildred Sullivan, to empower, educate and honor deserving students in the American South. Sullivan Awards are highly prized, and over the years have been bestowed on notable individuals including Eleanor Roosevelt, television icon Fred Rogers, and Supreme Court Justice Lewis Powell. For the past six years Keith has been president of Spartanburg Methodist College. As of July 1, she will move to Pfeiffer University in Misenheimer, N.C., a sister United Methodist institution, where she will be president. Before taking her position at SMC, she was executive director of development at Ohio University in Athens; prior to that, she was executive vice president at Methodist Theological School in Ohio. A native of northern New York, Keith has nearly 30 years of experience in higher education in capacities such as student services roles, program development, teaching, fund raising and administration. She holds a bachelor of arts degree in political science from the State University of New York at Binghamton, a master of education from the University of Pittsburgh in educational counseling and a Ph.D. in higher education administration and student affairs form The Ohio State University. Keith serves on boards of the Spartanburg Area Chamber of Commerce, which she chairs; the Mary Black Foundation; the Greer Education Foundation; the Arts Partnership of Greater Spartanburg; the Spartanburg Academic Movement; Spartanburg Regional Hospital’s Hospice Home; and Habitat for Humanity of Spartanburg County. On a state level, she chairs the President’s Council for South Carolina Independent Colleges and Universities Inc. and is the secretary for the South Carolina Higher Education Tuition Grants Commission. She also serves on the advisory board for South Carolina Women in Higher Education. On the national stage, she is past president of the National Association of Schools and Colleges of the United Methodist Church and continues on its board.